Since I just caught this, I'm not really quite sure what to think - should he be higher or *gasp* lower? I think I'll have to sleep on this one. You don’t understand Yao Ming. Admit it. You don’t understand where he came from as a rookie from Shanghai. You don’t get hard he has worked to transcend cultures and basketball philosophies, and you certainly can’t begin to grasp the pain he has endured to recover from foot surgery. All you need to understand is this. Yao MinYao Mingg, when healthy, is the best center in the NBA and the Houston Rockets’ title hopes rest on the success or failure of his return. Critics of Yao Ming say that he is a finesse player, lacking the killer instinct it takes to carry a team to a deep playoff run. That couldn’t be further from the truth. 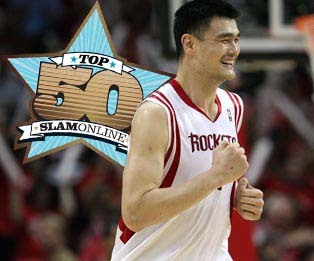 In Game 1 of the 2009 playoff battle against the Los Angeles Lakers, Yao came back from an injury to score 8 points in the final minutes of the game on way to a 100-92 win in L.A. The career-threatening injury Yao is recovering from? He got that by playing through pain in Game 3 of that playoff series. Don’t get it twisted. Just because Yao doesn’t mug for the camera every time he dunks doesn’t mean he isn’t hungry. Check out the article and the rest of 50 down at SLAM ONLINE.